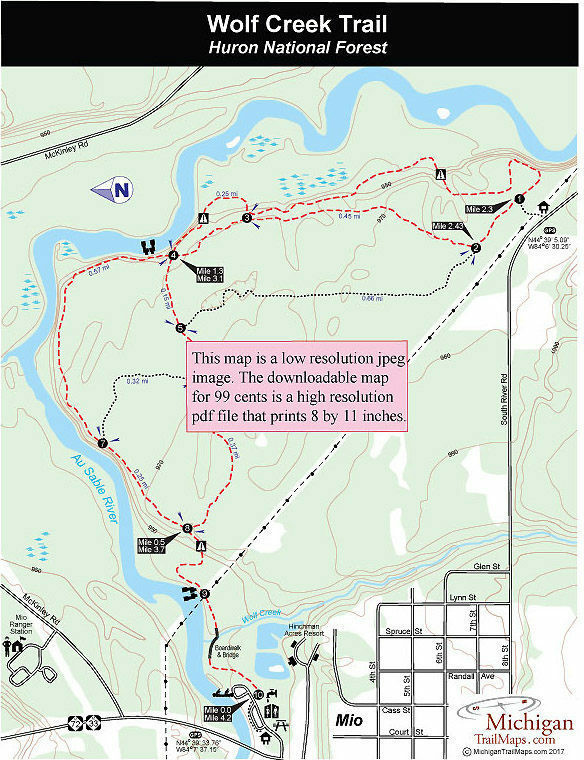 Wolf Creek is described by the National Forest Service as a “semi-primitive experience.” Yet it’s main trailhead is located right in the heart of Mio, Michigan. This is an unusual trail to say the least. 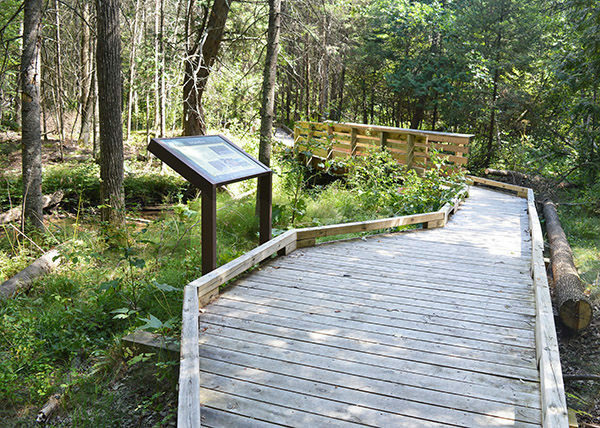 Part of the Huron National Forest, the Wolf Creek Trail was rebuilt in 2012 and today totals 4.8 miles along four loops with most of them adjacent to the system’s main feature – almost 3 miles of the Au Sable River. 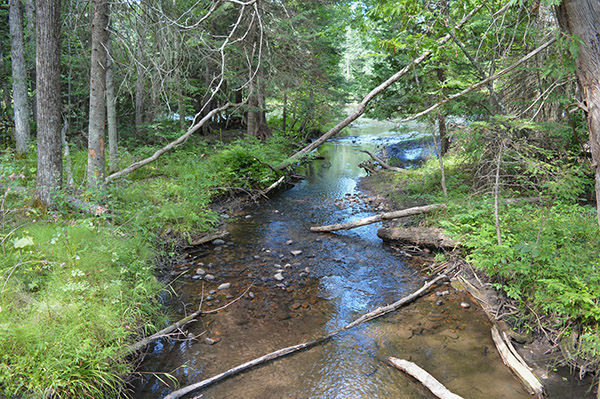 In the summer, many hikers begin at a bustling DNR canoe launch and picnic area, right off M-72/M-33 and within a stone’s throw of Mio’s two major canoe liveries. But within minutes of the parking lot, the canoe crowd disappears, replaced by a foot path winding through the woods and passing sweeping views of Michigan’s most famous river. In the winter, most cross-country skiers begin at a trailhead along South River Road, 2 miles from Mio, and rarely see anybody on the Au Sable. In this cold and snowy time of year, Wolf Creek Trail leads them into a heavily forested area that is definitely semi-primitive. The non-motorized trail is open to hikers, mountain bikers, cross-country skiers and snowshoers and is designed for loops as short as 1.8 miles to one described below, a 4.2-mile outing. Skiers will encounter a few downhill runs but not the death-defying slopes encountered at nearby Loud Creek Ski Trail, making Wolf Creek an easy ski overall. The trail actually begins at the west end of the picnic area and winds through the DNR facility before heading into the woods at post No. 10. Most hikers simply begin at post No. 10 where a stone path greets them. Within a couple hundred yards the trail becomes an impressive boardwalk. In the middle is a bridge across Wolf Creek and an interpretive sign about the Au Sable River which you can see through the trees, especially in the winter. Post No. 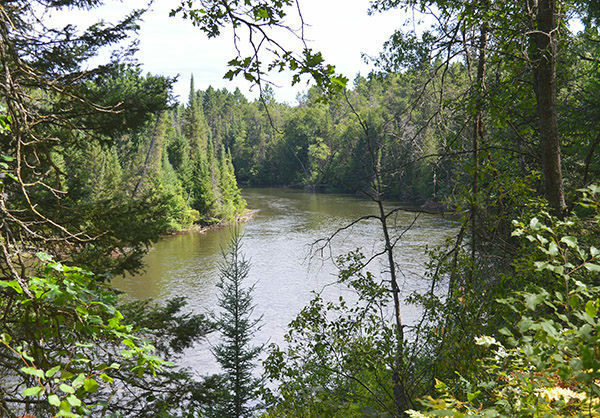 9 marks where a powerline crosses the Au Sable and beyond it you climb the river bluff to post No. 8 at Mile 0.5. Once on the bluff, the trail skirts the edge of it, providing glimpses of the river below through the trees and, if it’s a summer weekend, the flotilla of canoes often seen heading downstream. This is perhaps the most scenic stretch of the trail – summer or winter – and you continue to follow the edge for almost a mile until the trail descends the bluff and then re-climbs it to top off near post No. 3 at Mile 1.5. The next leg to South River Road continues to stay on the bluff in the beginning. But within a half mile the trail descends, swings to the west and makes a long climb back up before reaching post No. 1 at Mile 2.3. The post marks the short spur to the South River Road trailhead. Continue west (right) at the junction to return to the canoe launch. At post No. 2, two segments depart for the main loops along the river. The second to post No. 6 is actually shorter but the first to post No. 3 is more interesting, especially for skiers, as it’s a winding path that dips and climbs more. This route returns to post No. 4 at Mile 3.1 and remains as a level trail in a stand of pines, reaching post No. 6 within a quarter mile and returning to post No. 8 at Mile 3.7. Backtrack the first half mile of the hike to reach the canoe launch at Mile 4.2. At the DNR canoe launch along M-72/M-33 are toilets, picnic tables, grills and a source of drinking water. There are no facilities at the South River Road trailhead other than parking. There are no user fees for the Wolf Creek Trail. Wolf Creek Trail is located adjacent to Mio and has two trailheads. The first is on M-72/M-22 a half mile north of the stop light in Mio at the Michigan Department of Natural Resources parking lot and canoe launch. The second trailhead is 2 miles east of the stop light on County Road 602. This second trailhead is used primarily in the winter by skiers and snowshoers. For more information call the Mio Ranger District at (989) 826-3252.